Home / Beautification / Does Northridge Have the Most Dangerous Intersection in California? At the March 12, 2019 Northridge West Neighborhood Council meeting, this question was addressed by Devonshire Senior Lead Officer (SLO) John Parker. Officers Parker and SLO Patti Peteque went over crime statistics, and three recent homicides in Porter Ranch. The homicides were not a random act; they were between people who knew one another and likely involved drugs. The police are keeping other details private at this time. Statistically, it is true that the intersection of Devonshire Avenue and Reseda Blvd. has more accidents than any other in California. Officer Parker went on to say that this figure is very misleading because a significant number of those accidents occur in the two shopping centers on the North and South side of Devonshire. These accidents are often parking lot accidents with one car backing out and hitting another car, or cars going through carpool lanes at the fast food restaurants. Because the address of the exact location is not clear, officers write the location as the intersection of Devonshire and Reseda. The good news is that intersection isn’t so bad, but be careful in those parking lots. Also discussed were plans to raise the speed limit on Wilbur Avenue from 40 to 45 miles per hour. 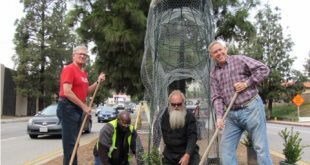 The Council sent a letter of protest to the LADOT. Officer Parker explained how speed limits are determined. One of the problems with antiquated speed limits is the city cannot legally enforce them per state law unless a car is traveling at an excessive speed. The Northridge West Neighborhood Council Elections will be held at Nobel Jr. High School on May 4th from 10:00 a.m. to 2:00 p.m. Please turn out and vote. We have eight candidates running for six At-Large seats, and no candidates have filed for the Community Interest Stakeholder Seat. The filing period is over, but if you are interested in the open seat, make your intentions known to President Pamela Bolin. Those running are Alma Fernandez, Jennifer Krowne, Gail Lapaz, Jonathan Legg, Rana Sharif, Kelly Sooter, Josh Toscano, and Glen Wilson. You can learn more about the candidates by going to the City Clerk Website https://clerk.lacity.org/elections/neighborhood-council-election to learn about the elections and read the candidates statements. What is Next for the Tampa Medians? If you’ve traveled up Tampa Avenue to the 118 Freeway, you have probably noticed the recently placed topiary horses. If you are interested in how and why they came to be placed there, see the article in the February 27 edition of the Los Angeles Daily News. The idea of the topiary was to place animals that might have been found on a 19th Century California Rancho. 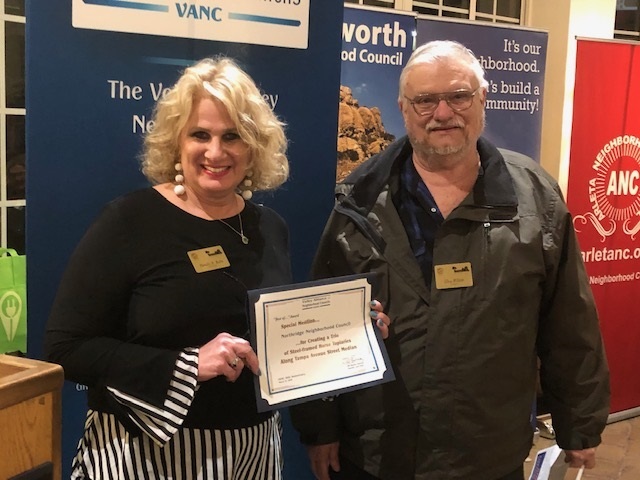 President Pam Bolin received a VANC Best of Award from the Valley Alliance of Neighborhood Councils on March 14, at CBS Studios, for Community Beautification. In other actions, the board approved a grant of $1000 to the Southern California Disaster Preparedness Foundation to support the 12th Annual Valley Disaster Preparedness Fair on Saturday, October 12, 2019, at the Northridge Mall. It also approved a grant of $2500 to the Northridge Hospital Foundation, Center for Assault Treatment Services (C.A.T.S.) annual event, which educates the community on sexual and domestic violence while raising funds to continue providing free services to victims. The board voted to support the Crosswalk Mural Traffic Safety Initiative, “The Mary Project”, in partnership with Arts Bridging the Gap for Safety Workshops for the LADOT’s People Street Initiative. The board approved taking $1500 from the Outreach Account and adding it to the Elections Account to send a second mailer to our stakeholders informing them of the May 4 Neighborhood Council Elections at Noble Middle School. The Board approved $800 for the purchase of signage to be placed on Tampa Avenue informing stakeholders that NWNC paid for the topiary. Approximately 50,000 cars a day pass this location. As always, we are interested in your opinions and ideas. You are welcome at all our regular meetings, held the 2nd Tuesday of each month at Northridge Christian Church. Meetings start at 6:15 p.m. and food is provided.